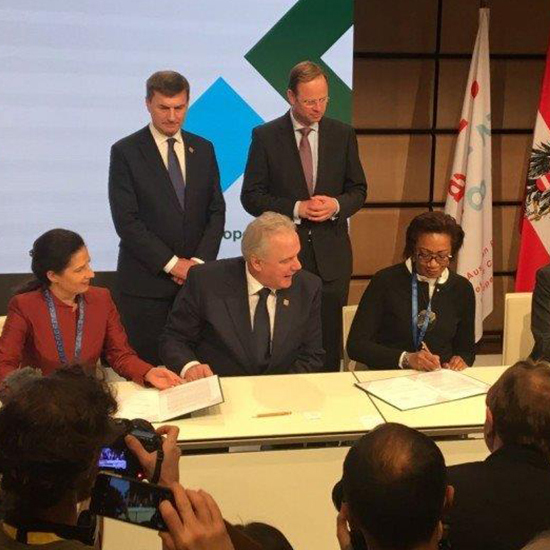 In December last year, FMO and the European Commission (EC) signed a contract for a risk-sharing facility NASIRA at the High-Level Forum Africa-Europe, which was held in Vienna. The EC has approved up to EUR 75 million in guarantees and up to EUR 8 million in Technical Assistance to FMO’s innovative financial program. NASIRA uses guarantees to allow local banks to on-lend to underserved entrepreneurs within the European neighbourhood and Sub-Saharan Africa. It targets portfolios consisting of loans to young, female and migrant entrepreneurs (including refugees, returnees and internally displaced people). The goal of these guarantees is to allow local banks to provide loans to groups they normally perceive as too risky. By so-called ‘risk-sharing’ NASIRA reduces the perceived and real risks of lending to vulnerable and underserved parts of the population. Thus, it enables and stimulates financing needed for people who want to grow their (micro) business. NASIRA is an example of blended finance, bringing together public and private funding. The guarantee for NASIRA is provided by the European Fund for Sustainable Development (EFSD). The Dutch government also supports NASIRA with a €7.5 million contribution from the MASSIF fund, which is managed by FMO. By catalysing other investors, the program is expected to support EUR 500 million in financing. At the High-Level Forum Africa-Europe in Vienna, Dutch prime minister Mark Rutte emphasised the importance of stimulating entrepreneurship and job creation, and highlighted NASIRA as an example: “By turning challenges into opportunities, NASIRA truly helps to address poverty and to give people reason to commit to a future in their own community. Jobs are key to the future and it’s up to us, as governments and political leaders to work together and make sure that more and more people become empowered to take that future in their own hand”, he said.